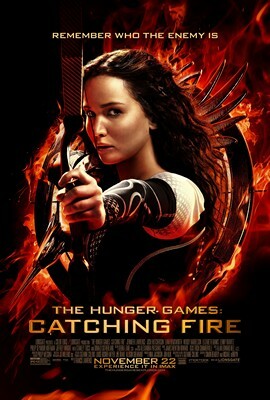 First things first: this movie easily surpasses its predecessor, the first Hunger Games. This makes me really happy because when I saw the original, I was a little bitter about it being a watered down adaptation of one of my favorite movies of all time: the original dystopian student brawler film, Battle Royale. In Catching Fire, the Hunger Games world is significantly developed and the true crux of the story is revealed: it’s about revolution from tyranny. And this narrative is so much more compelling than the last one. The original Hunger Games was poorly suited to focus directly on mortal combat between children because it was created and marketed as a mainstream mass-market film. It couldn’t show the level of brutality depicted in Battle Royale, even though brutality and violence was at the very core of the principle of the first Hunger Games movie. Catching Fire doesn’t try to be something it can never be. Turns out it’s well suited to be about revolution, with good characters played by a great cast. The protagonist Katniss is a master archer living in the dystopian future who managed to survive the previous Hunger Games (as Woody Harrelson said, there are no winners, merely survivors). After Katniss, the villain, acted by Donald Sutherland, is the most important character. And he is really good: President Snow is fantastically evil and well acted. Phillip Seymour Hoffman appears in this iteration as the “Head Gamemaker” who acts as the Sutherlands sidekick. Although he has precious few lines to develop his character in Catching Fire, the stage is set for him to be an incredible character in the upcoming Hunger Games films. And thankfully, Woody Harrelson reappears as Katniss’ mentor and previous Hunger Games victor Haymitch. There are a few other characters of little consequence, like Lenny Kravitz who is a fashion designer who makes a remote controlled dress which catches on fire and turns into a feathered costume straight out of Black Swan. In Catching Fire you begin to really see the psychological ill effects that murder have taken on Katniss, and it adds significant dimension to her character. In the first film it felt like combat sequences were indirect and distant, and to me that feels like an unauthentic way to tell a story which is so soaked in blood. Catching Fire feels similarly emasculated, although to a much lesser extent since the focus is no longer on the combat itself. In this movie you begin to see and feel that killing people has caused terrifying and irrevocable psychological damage on Katniss. It gives the entire movie more emotional gravity. One important thing to note about this movie is that it doesn’t really end. It builds to a crescendo and the credits roll at a monumental cliffhanger. Considering that it took over an hour before the ‘Hunger Game’ in this movie had even begun, it was easy to see this coming, but it still feels a bit underhanded. Given that this movie was very good though, I am really looking forward to its successor, which is scheduled for release in November 2014. The stage is set for that film to be the best in the series, with both Donald Sutherland and Phillip Seymour Hoffman playing much more central roles. This movie is good. I’m glad I took a few hours to check it out at the Miramar IMAX theater here in Taiwan.